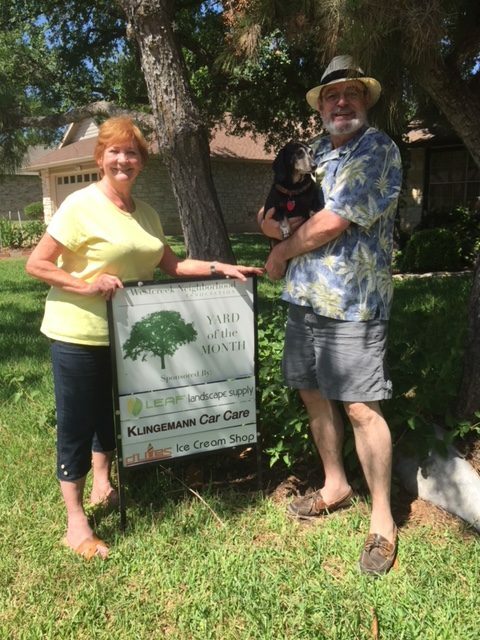 Congratulations go out to Gail & Barry McAtee at 6315 Steer Trail for their lovely yard. Among the plants in the yard are Japanese Boxwoods, large Swordfern, Nandinas, & two large Pine Trees! Gail was thrilled with my presentation of YOM & quickly showed me a picture from 20 years ago when they had won YOM! That’s farther back than my records go! In the backyard, Gail & Barry showed me the Texas shaped brick patio they had installed and, it was here that they were married! In the picture with Gail & Barry is their sweet dog Bella. Gift certificates from Leaf Landscape, Klingemann’s Auto, & D’Lites Ice Cream were presented to the couple. Be sure to frequent these shops and please thank these neighborhood businesses for their support of our YOM program! This entry was posted on Thursday, July 12th, 2018, 6:54 pm and is filed under Yard of the Month. You can follow any responses to this entry through RSS 2.0. Both comments and pings are currently closed.